Kendyll Hilegas uses gouache, watercolor, and colored pencil to capture the frosty nostalgia of snow cones. Who can resist cooling off on a scorching summer's day with a slushy ball of pristine snow soaked with sweet and tangy fruit flavors? Boston-based artist and illustrator Kendyll Hilegas works in layers of gouache, watercolor, and colored pencil to capture the nostalgia of diving into a frosty snowcone on a hot day. She celebrates the vibrant palette of the season with a rainbow of sherbet tones. 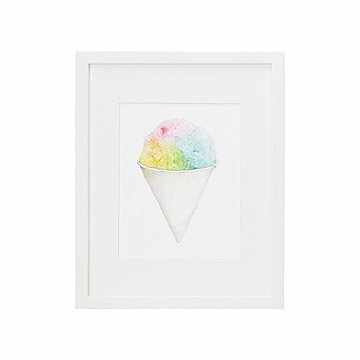 Display this delectable ode to this frozen treat in any room and relive the fairer seasons on a dreary winter's day. Printed in Oregon. Arrives ready to hang in white wood frame, or unframed in acid free mat.